There has been a lot of good work carried out recently on Database forensics approached from the OS, particularly using reverse engineering techniques to understand the format of metadata in the datafiles such as timestamps . However it is commonly found in practice that OS level access is denied to the DB team in order to enforce segregation of duty. Additionally the Terrabyte datafile size of many commercial enterprise DBs makes Datafile analysis impractical. The impact of this is that DB level methods of verifying the state of an object or dataset are often more useful. The above is a good reason for using a checksum method of verifying the integrity object source code e.g. 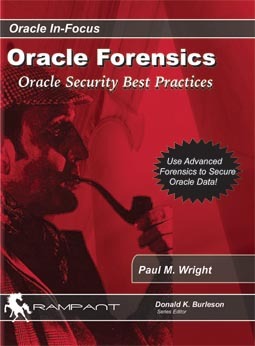 this code adapted from newly reprinted Oracle Forensics Book, creates checksums of oracle triggers. However the SCN to timestamp relationship is not direct and can be changed, for instance when a client DB connects to a server DB via a dblink the SCN of the DB with the lowest SCN will become the same as the SCN on the DB with the higher SCN. (Incidentally this fact could cause a denial of service if the client DB had an SCN close the maximum).. So timestamp/SCNs are not perfect for verifying integrity ~ what is needed is statechecking for evidential data itself? This is the realm of DB Data Forensics. Ok ~ so the aim in this example is to check that the evidential data in a table has not changed from a previously known state (I have used dual here for convenience so replace dual with the table to be statechecked). –1.Select the checksum for the dataset returned by the required query. -If a result set is returned (as above) then the state of the table data is the same as the previous known checksum. -If “no rows” are selected then the state of the table’s data has changed from that represented by the previous known checksum (9D9DFF9320E27082B15B4ED7A086BA83). This is a great feature of Oracle, though remember that this query has a high performance hit but the performance hit can be decreased by changing the last argument of DBMS_SQLHASH.GETHASH to 1 (md4) and security increased by raising to 3 (sha1). ….Perhaps we will soon be celebrating the Chinese Year of the Hedgehog? Though the problem of securing sensitive data once it has left the DB is still in process..
Seperate point – I noticed an interesting post on collecting evidence regarding the activity of a Toad user at the excellent SANS Forensic blog. Also a tool named Fuzzor, for Fuzzing Oracle PL/SQL input, has been released by Slavik at his blog which often has new material of interest. There are quite a few exploits since the January 2009 CPU. I still have bugs outstanding so there is still work to be done..especially with regards to DB Data Forensics.. Thanks for the interesting update Danny. I have made a note to revisit Fidelis’ feature set in future. It would be interesting to know what versions of TNS FIdelis supports as I have had experience of IDS/IPS not implementing TNSv9 (10g) properly as it had not updated from TNSv8 (9i)?